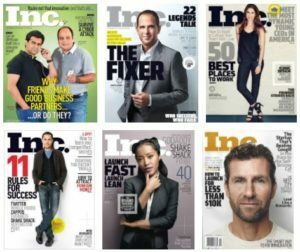 I’ve been a subscriber to INC. magazine for years. I take away a nugget or two from every issue. In this most recent March/April issue, I started to read an article about a concept called the “active office.” It looked interesting. The article began with what appeared to be an interview with the CEO of VariDesk, a manufacturer of sit/stand workstations. As I read further, I realized it wasn’t an article, but a well-written sales pitch and ‘advertorial.’ At the top of the page was the tiny header, “Branded Content.” And right next to the article was a full-page VariDesk ad. It really angered me (both VariDesk and INC.)… trying to hide their advertising under the guise of editorial content, even designing the page so that it looked like a standard article. Now, whenever I read any article in any magazine, I look for the “Branded Content” header at the top of the page. Kind of sad, huh? It was the perfect example of a lesson we share with all of our clients and emphasize during conference presentations… Stop using content marketing to sell! Your blog posts, eBooks, webinars, infographics, etc. should be used to inform and educate, to solve problems, to share opinions and observations, maybe even to inspire. And when developed with those goals in mind, content marketing helps to build and cement your reputation in the markets you serve, create top-of-mind awareness and (when gated) generate sales leads. But the second that you use your content to sell… all of your credibility is lost. And all of your content – from that point forward – becomes suspect (like with the INC. magazine articles). By contrast, every month, in INC., I like to read the column by Jason Fried, Founder of the software firm, Basecamp. His are generally articles about managing growth, effective people management and other challenges business leaders and owners have to deal with every day. Never once, though, has he pitched his products or overtly promoted his company. Yet, because he’s sharing interesting, useful ideas, he has positioned himself as a thought leader… and, by extension, positioned his firm as the kind of company you want to do business with. Nicely done! As a marketing & sales consultant, I love smart, effective marketing and advertising. But in the world we work in – B2B professional services – the use of content marketing like I saw in INC. magazine has no place. In fact, trying to fool your audience will deliver the exact opposite result you’re looking for… it will cause companies to not want to buy from you. So, stop using content marketing to sell. Instead, put yourself in the place of your potential buyers and share with them your knowledge and expertise. Provide them with ideas to help them solve problems and do their jobs better. Bottom line… seek first to help, then to sell.